Hey all! Sometimes, the fur of your pet can get tangled due to it being too long or because of dirt. It gives them a scraggly, disheveled appearance which isn’t nice. We want them to look beautiful all the time! This scrub will take of the problem. 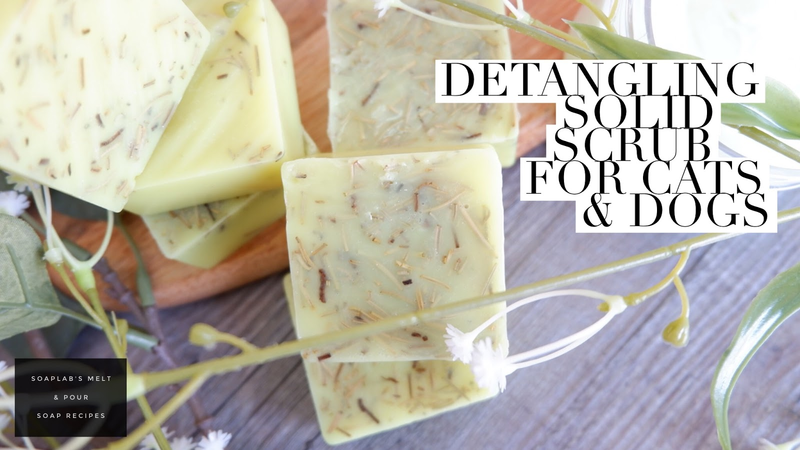 To make the scrub you need a shea butter soap base, lemon essential oil, jojoba oil, honey and dried rosemary. We added yellow liquid color pigment for coloring. Shea butter softens the fur and hydrates the skin. It also gives the fur a nice shine. Lemon essential oil has anti-fungal properties, keeping the skin and fur healthy as well in the process of detangling. Jojoba oil keeps the fur light and moisturized, therefore, making it harder for the fur of your pet to get tangled again. The antibacterial properties of honey will prevent any infections from happening, while the dried rosemary acts as a gentle exfoliator. we hope you try this recipe on your pets coz it worked for us!